By 1920 the Rural Municipality of St. James was partially developed following a sustained period of growth at the beginning of the 20th century. The years between the mid-1940s and the early 1970s within metropolitan Winnipeg were a time of significant expansion and development, as the constraints of nearly a generation of economic hardship and war dissipated. The advent of social programming, and the participation of municipal, provincial, and federal governments in post-war economic stimulation adjusted the previously fundamental structure of the city, resulting in a steady residential spread outwards and the creation of new roads and services to accommodate this sprawling development. The population within the suburban municipalities more than tripled between the years of 1941 and 1971, as a response to the changing values of returning soldiers and their families, and the desire of the parents of the “baby boom” generation to own their own homes. The new residential neighbourhoods of Silver Heights (between the Assiniboine River and Ness Avenue, bound by Conway and Davidson Streets), Westwood, Crestview and St. Charles developed during this period. Generally, post-war construction within St. James is typified by low-density, fully detached, single-storey suburban homes on generously sized lots. Carports or garages were generally sited adjacent to the homes and are often attached or connected by breezeways. The bungalow, set on a rectangular site-cast reinforced concrete foundation, dominated the market. Common in the floor plan of these homes is a separation between more public areas (living and dining rooms, front entrance and garage) and the bedrooms or more private regions. 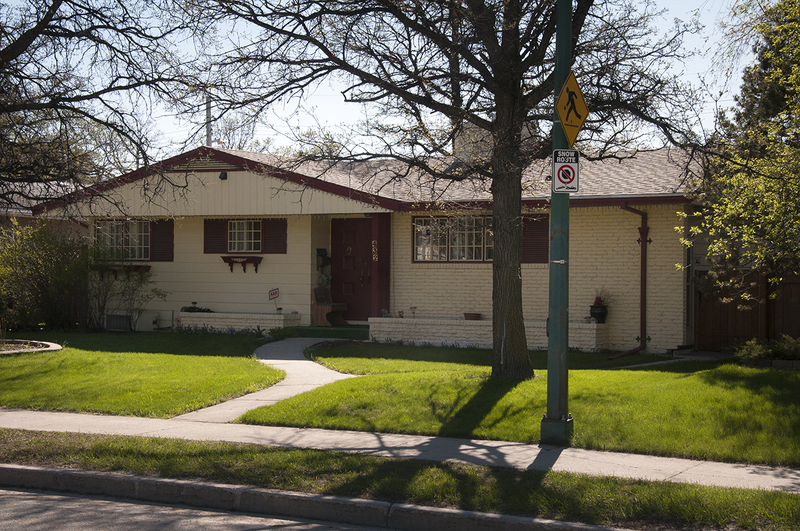 Also of note is the general lack of front porches, common in Winnipeg’s older more pedestrian-focused neighbourhoods. Focus shifted instead to the leisure, social and recreational potential of a home’s back and side yard. Also of note is the common appearance of a large front picture window. The Rural Municipality of St. James became the City of St. James in 1956, and in 1967 merged with the Town of Brooklands to become the City of St. James-Assiniboia. In 1972 the region became part of the City of Winnipeg, under Unicity. Doors: The main entryway is a double door located at the front of the house, raised a single step above grade. Roof: Peak roof, perpendicular to Moray Street. 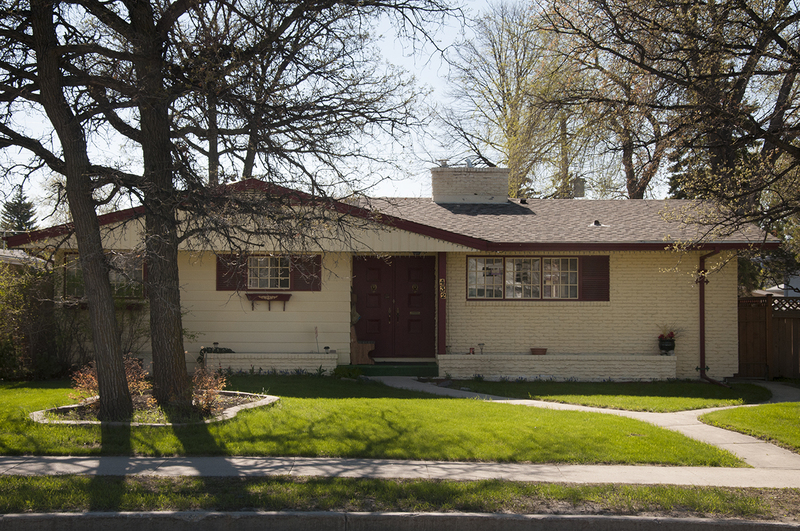 The house has one gable on the south east side of the entryway. Materials: Brick with extruded mortar joints and wood siding.